Henri Lefebvre, La Production de l’espace, Paris: Editions Anthropos 1974; English translation: The Production of Space, Oxford: Blackwell 1991. The quotations in the article follow the English edition. 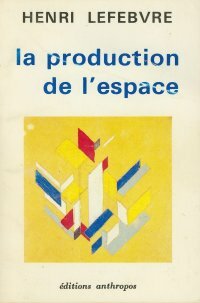 The Production of Space by Henri Lefebvre (1901-1991) is widely considered to be one of the most important books which facilitated the ‘spatial turn’ in social and cultural theory by introducing space, as an interpretative concept, into sociological, political, economic, historical and cultural analysis. This reorientation was the programmatic objective of this book which aimed to relate and define ‘all possible spaces, whether abstract or real, mental or social’ (p. 299), and thus account for a wide range of spaces, from those of the body to those of the planet. The introduction of the category of the ‘possible’ into research about space resulted in the concept of ‘social space’. 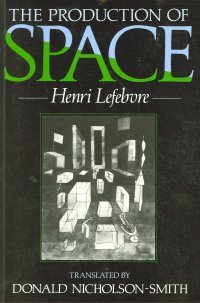 In The Production of Space Lefebvre wrote (p. 73): ‘[...] itself the outcome of past actions, social space is what permits fresh actions to occur, while suggesting others and prohibiting yet others.’ Developing this concept, he theorised space both as a product of social practices and as their instrument, medium, and milieu (p. 411). This instrumentality of space was thus not limited to economic productivity, for it could also facilitate political engagement. Although formulated thirty years ago, this politicised concept of urban space has again become topical because it proposes an alternative to today’s dominant definition of urbanity in terms of consumption and spectacle. Lefebvre’s concept of space as socially produced and productive in social practices is ontologically heterogeneous. He distinguished two triads of ‘moments’ of space: spatial practices, representations of space and spaces of representation or, alternatively, the perceived, conceived and lived space. Spatial practices were theorised as practices of physical transformation of the environment; representations of space were understood as theories and effigies of space in science, architecture, urbanism, art, and mass-media; and spaces of representations - related to power, the body, ideas and ideologies - were described as appropriated and dominated by social groups. While spatial practices produce ‘perceived’ spaces, representations of space relate to ‘conceived’ spaces, and spaces of representation are approximated as ‘lived’ spaces. However, the relation between these two triads is never complete in The Production of Space, reflecting the uneasy relationship between two philosophical traditions on which Lefebvre’s theory of space was based: Marxism and phenomenology. Read today, this hybrid conceptual framework appears to be one of Lefebvre’s most promising proposals, for it facilitates research about the contemporary complexity of processes in which urban spaces are produced: conditioned by economic and political determinations, transformed by technology, saturated with images, mediated in the news and yet constantly appropriated in the practices of everyday life. At the same time, the broadness of Lefebvre’s concept of space inevitably means that his theory is provisional and it cannot provide universal categories applicable in every context in the same way. Lefebvre underscored that the triad of spatial practices, representations of space and spaces of representation ‘loses all force if it is treated as an abstract ‘model’’ (p. 40). The three aspects of space cannot be grasped by one general formula, but must be studied by means of a detailed analysis which takes into account historically specific situations. Lefebvre carried out several such analyses which included his account of the Paris Commune11 and his testimony about the ‘event’ of May 1968 in Paris.12 The latter was seen by Lefebvre as an ‘explosion’ of contradictions inherent in French post-war society, encapsulated in the functionalist space of Nanterre university campus, where he was a professor of sociology from 1965 to 1973. In both books Lefebvre examined dynamic ‘centralities’ understood as nodes of spatial practices, representations of space and spaces of representation, or perceived, conceived and lived space. These studies of historically specific centralities were developed in The Production of Space. The narration of a development from the mythical ‘natural’ space through the ‘absolute’ and ‘political space’ to the ‘abstract space’ of 20th century capitalism and the ‘differential’ space of future society is a part of Lefebvre’s book which has been often criticised, or discreetly passed over in silence by commentators sensitive to the shortcomings of grands récits. Although several of Lefebvre’s formulations justify this criticism, it seems more productive today to read his book less as a historicist exercise than as an analysis of historically specific relationships between the three ‘moments’ of space. In some ‘favorable’ circumstances the moments converge; in others they are divided by gaps, hiatuses and discrepancies, as it was the case - according to Lefebvre - with French post-war urbanism. These examples suggest that the impact of The Production of Space reaches beyond a particular discipline - which is another argument why this book should be translated into German. Lefebvre’s theory provides contemporary urban and historical research with useful concepts, above all the concept of ‘social space’, conceived in terms of the triads of spatial practices, representations of space and spaces of representation, and of perceived, conceived and lived space. Being hybrid, this concept addresses the complexity and heterogeneity of the production of urban spaces; being open-ended, it allows adjusting the analyses to the specificity of each situation; being oriented towards the possible, it is sensitive to the tendencies of an emerging urban society. 1 Henri Lefebvre, La Pensée marxiste et la ville, Paris 1972. 2 Lefebvre, Le Droit à la ville, Paris 1968; Lefebvre, La Révolution urbaine, Paris 1970. 3 Lefebvre, Critique de la vie quotidienne, 3 volumes, Paris 1947/62/81. 4 Lefebvre, Du rural à l’urbain, Paris 1970. 5 Lefebvre, Au-delà du structuralisme, Paris 1971. 6 Lefebvre, De la science à la stratégie urbaine, in: Utopie 2/3 (1969), pp. 57-86. 7 Lefebvre, Qu’est-ce que le passé historique, in: Les Temps Modernes 161 (Juillet 1959), p. 159-169; in English: What is the Historical Past?, in: New Left Review 90 (1975), p. 27-34. 10 Lefebvre, Perspectives de la sociologie rurale , in: Lefebvre, Du rural à l’urbain (fn. 4), pp. 63-78. 11 Lefebvre, La Proclamation de la Commune, 26 mars 1871, Paris 1965. 12 Lefebvre, L’Irruption de Nanterre au sommet, Paris 1968. 13 Manuel Castells, La Question urbaine, Paris 1972; cf. Géraldine Pflieger, De la ville aux réseaux. Dialogue avec Manuel Castells, Lausanne 2006. 14 Castells, The City and the Grassroots, London 1983. 15 Bohdan Jaowiecki, Spoeczne wytwarzanie przestrzeni, Warsaw 1988. 16 Edward Soja, Thirdspace, Cambridge 1996. 17 Christian Schmid, Stadt, Raum, Gesellschaft. Henri Lefebvre und die Theorie der Produktion des Raumes, Stuttgart 2005. 18 Roger Diener et al., Die Schweiz - ein städtebauliches Portrait, Basel 2005. 19 Cf. Jean-Pierre Garnier, La vision urbaine de Henri Lefebvre, in: Espaces et societées 76 (1994), pp. 123-145. 20 Laurent Devisme, Actualité de la pensée d’Henri Lefebvre à propos de l’urbain. La question de la centralité, Tours 1998. 21 Łukasz Stanek, The instrumental use of representations of space in the practices of production of space in a postcommunist city, in: Patrick Healy/Gerhard Bruyns (eds. ), De-/signing the Urban. Technogenesis and the Urban Image, Rotterdam 2006, pp. 284-301. Łukasz Stanek, Methodologies and Situations of Urban Research. Re-reading Henri Lefebvre’s ’The Production of Space’, in: Zeithistorische Forschungen/Studies in Contemporary History, Online-Ausgabe, 4 (2007), H. 3, URL: http://www.zeithistorische-forschungen.de/3-2007/id=4715, Druckausgabe: S. 461-465.